Does an unpleasant whiff of your car make you feel annoyed? Time to enjoy a pleasant fresh fragrance every time you step in your car with Droom Car Perfumes. These gel-based car perfumes give a long lasting fresh feel, making your driving experience even better. Buy now and you can save jaw dropping 99% on car perfumes. Droom is running its Car Perfume Sale on 12th September 2017 starting 11:00 a.m. Quickly visit our website or log on to Droom mobile apps to order car perfume for ₹1. You read that right, it is ₹1. 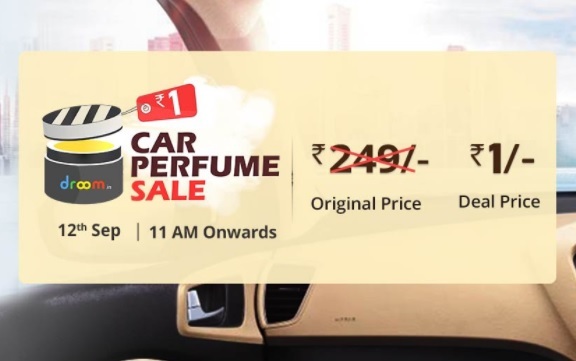 Droom is offering 99% discount on car perfumes, so, instead of original price ₹249 you get it for ₹1 only. These days you hardly get anything for ₹1, a hot deal like this is definitely a must-buy. Our quantities are limited so buy now rather than regretting later. You can also buy car perfumes under Droom Merchandising Store along with other Droom branded items like helmets, t-shirts, mugs, keychains, pens, stationary and more, at economical prices. So, what are you waiting for? Rush over to droom.in and order before it is gone.